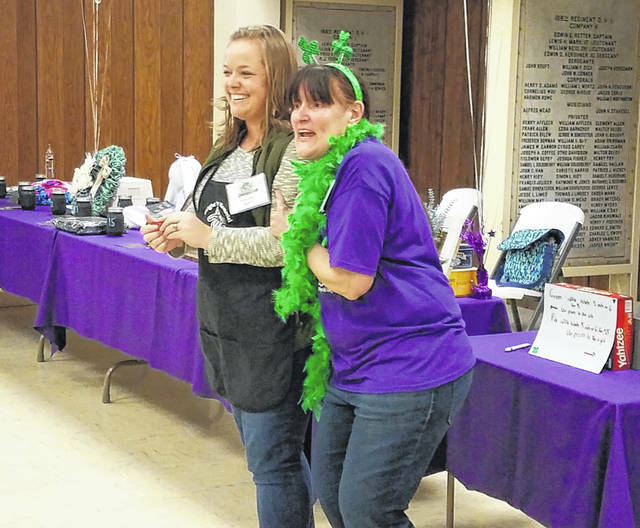 April McCarty and Debra Corbell-Grover volunteered Saturday during the annual Dwight Turner Memorial Spaghetti Dinner at the Fayette County Commission on Aging, which serves as a fundraiser for the Fayette County Special Olympics program. A large crowd turned out to help support the program and enjoy a nice meal. https://www.recordherald.com/wp-content/uploads/sites/27/2019/03/web1_20190316_180811.jpgApril McCarty and Debra Corbell-Grover volunteered Saturday during the annual Dwight Turner Memorial Spaghetti Dinner at the Fayette County Commission on Aging, which serves as a fundraiser for the Fayette County Special Olympics program. A large crowd turned out to help support the program and enjoy a nice meal.